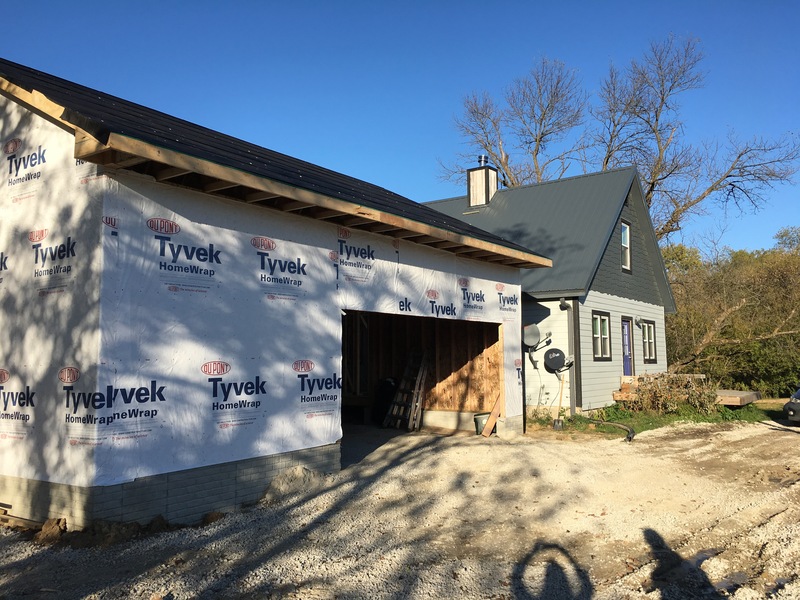 Friends, you have no idea how excited I am to be posting about our almost-garage! Really. This project has been two years in the making—planning, sketching, trash that plan, start over. 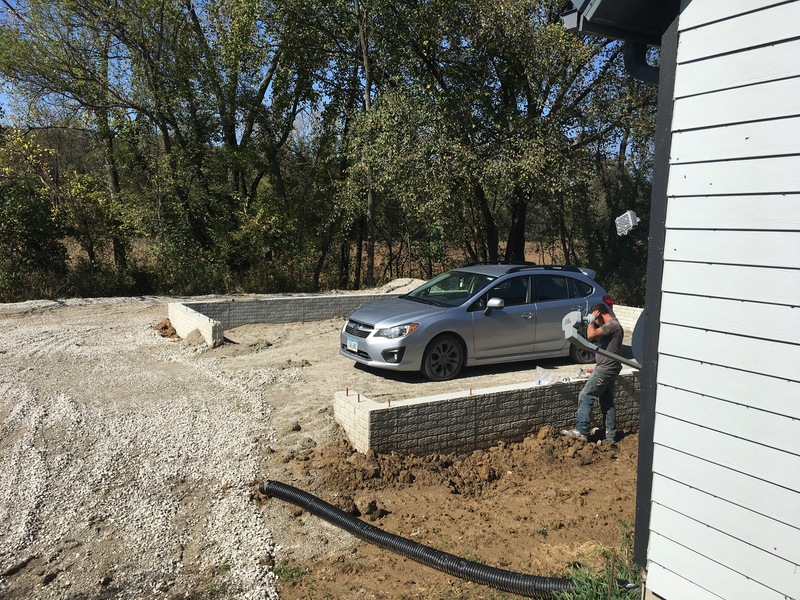 And, when we finally settled on the garage’s location, footprint, and floorpan, it turned in to a whole lot of waiting paired with frustration and maybe a bit of downright anger (with angry tears). Quite frankly, this blog post could be War & Peace-esque in length if I went into all of the drama. But I won’t. I’ll spare you the detailed account and instead give you a bullet point idea of the timeline. April 1, 2014: Cockamamy Farm is legally ours. This place is tiny. And we have no outbuildings. And no closets. A garage should be a priority! May 2014-March 2016: Should the garage be attached? If so, how? Should it be behind the house? East side? West side? How will the driveway work? Do we have room for a turn around? Etc, etc, etc. March 2016: We finally have a plan we both like, the garage will be attached via a mudroom that connects to our existing laundry room/pantry. It will be sited on the west side of our house on what is currently a giant crater in the earth. Yes, we know it will require thousands of dollars in dirt, dump trucks, skid steer work, etc. Late April 2016: We hire a general contractor whom we really like and came with high recommendations and accolades from neighbors. He immediately hires a local concrete contractor. They meet with us on several occasions to solidify details of the plan. We feel good and we are assured that I will have a place to park before the snow flies. Awesome. May 2016: Bank paperwork is all done. We officially have the loan to make this project happen. We tell guys that we are ready to get started! Let’s do this! Last days of June 2016: “We will be there Monday to get started.” —concrete guy. Joy! Late August 2016: Frustration overload. Here’s where those angry tears come in. Early September 2016: We reach out to general contractor. He’s been waiting on concrete guy to do his job first. We express frustration with a summer of being lied to/put off/ignored. 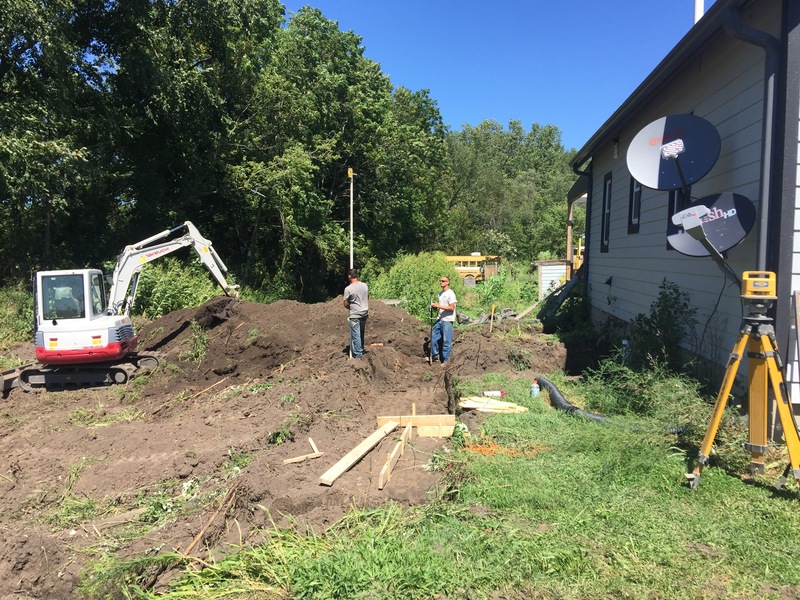 He calls concrete guy and finally, the work below happens…earth is moved, foundation is poured. The day the walls above were poured, I got home from work and noticed something was slightly off…the place where the new foundation walls attach to the house is not at the back of the house where the laundry room is located. Rather, these walls attach to the middle of the house. Right out side the bathroom. Seriously? Yup. As it was poured, the mudroom to connect the house to the garage would open off the bathroom. Isn’t that such a nice way to enter the home? Argh. The foundation was supposed to be set back six feet from the front of the house…they poured it even with the front of the house. Now, it’s come to Jesus time! Our contractor and the concrete guy show up at our house for a meeting to figure out how to fix this six-foot problem. The concrete guy is all ego and gusto and “I did nothing wrong. I followed the plans I was given.” Total denial. Lucky for him, we are creative people, even in the face of adversity and (at this point) extreme frustration. Our contractor brought another builder guy with him to the meeting. 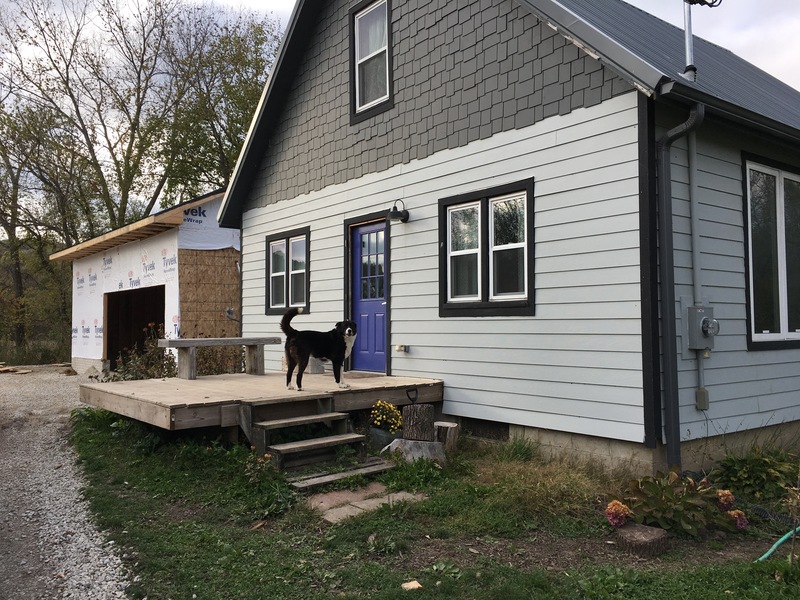 The two of them, with Ben, were able to noodle out a plan to use the foundation as it stands but still give us a mudroom that connects to the laundry room (thank goodness). Cool. Let’s make this work for everyone—no need to tear down 9-foot concrete walls, no need to scrap it all and start over (which at this point would be next year). Turns out there’s a reason our contractor brought this new guy with him. The new guy would be our builder. Because our contractor had shuttered his business over the summer and taken a job running a commercial building outfit. Great. So he brought in this new guy to finish all his outstanding jobs, including our garage. There’s more drama here with the concrete guy and this new builder guy that I won’t go into…but basically we sacked the new builder guy and I had to call the father-in-law (business owner) of the concrete guy and fill his ear and demand (in my sweet Southern charm way) that they fix and finish this job. Now. Late September 2016: Dirt arrives. And I mean 30 dumptruck loads of dirt. Tons and tons of dirt to fill in the foundation inside and out. And when those dump trucks were done, I could actually park in what will some day be my garage. A few days later, our building materials started to arrive. Did I mention we hired a new builder? Well, we did. Ben took on the job of general contractor and did all the ordering of materials. Lumber, plywood, roof trusses, all showed up on a couple of semi trucks. They backed into our driveway (not an easy thing to do in a regular car, much less an 18-wheeler!) and off loaded the materials. A few days later, the building crew arrived. And in very short order, they have created a building from what was a pile of lumber! Day One…from piles of lumber to standing walls. Looking west from back porch of house. Fletcher surveys the action. North wall is going up. West and north walls framed. The platform on the right is the mudroom floor. The garage door will be 16 feet wide. Ben, Okra, and Fletcher are standing in the mudroom. The mudroom (far right) will also have an exterior door opening onto the space between the garage and house. We are calling that space our “secret garden”. This will become the main entry to the house. The secret garden, small porch, and mudroom. Closet on the left! The north wall of the garage will have French doors opening onto the back yard. The mudroom will connect the laundry room/pantry to the garage. This window will become a door. 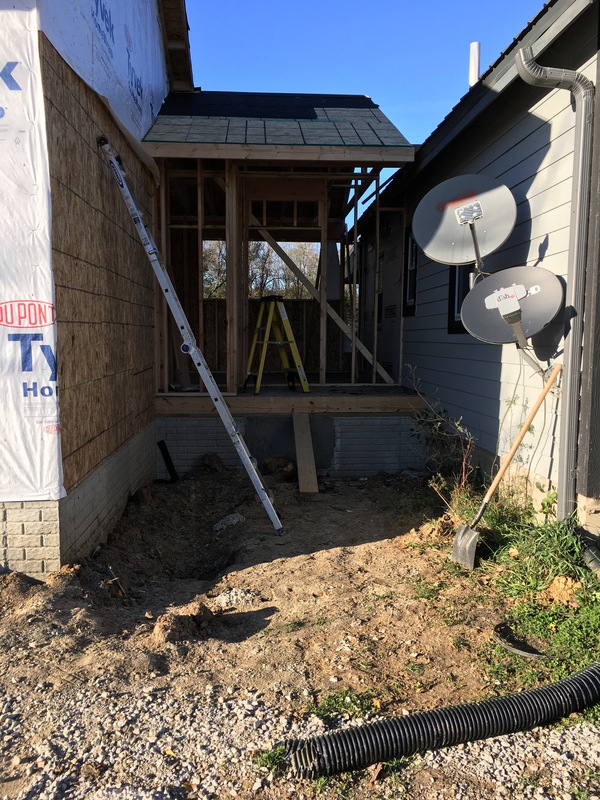 Day Three…Houston, we have a roof! 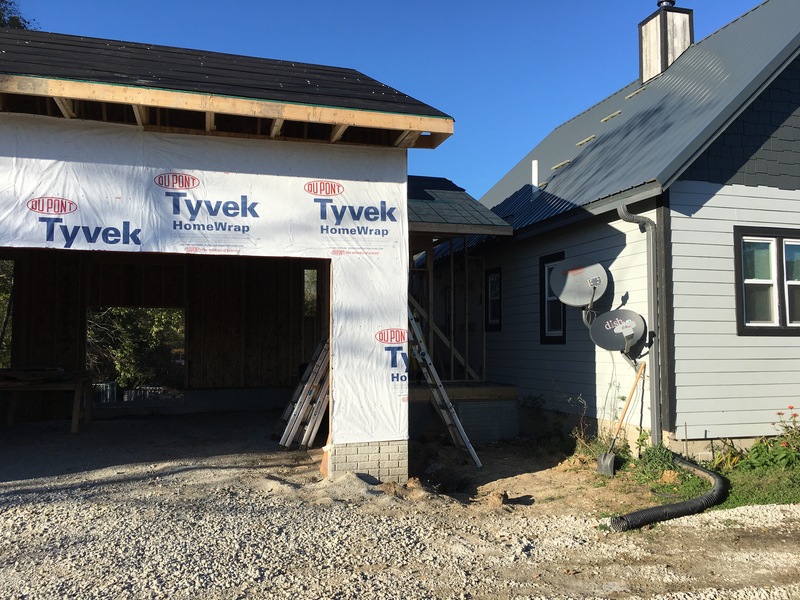 Day Four…roof felt, wrap on walls, and Ben found roof steel to match the house (amazing that this was even a problem)! Hallelujah! Looking in the big garage door, you can see the north wall, which will provide lots of natural light for Ben’s workshop. One the left will be a huge window Ben is building out of glass shower doors we scored at the Habitat ReStore. The center opening is the pair of French doors. On the right is another ReStore find: A gorgeous old French door (divided lights, wavy glass, the works!) that we are framing and hanging horizontally as a window on the north wall of the mudroom. Now, we are back to waiting. Waiting for the roof steel and the siding to arrive. It will be a couple of weeks or so. Then, our amazing building crew will be back to finish the job, including putting a hole in our current roof to tie the two together, and making a door out of the small laundry/pantry window. I hope I’m not home when that stuff happens. I might cry tears of joy!! Mixed with terror and anxiety, of course. Stay tuned for the final legs of this journey…one that couldn’t be done soon enough, if you ask me. This experience is one that has Ben repeating, “If you want something done right, you have to do it yourself.” And just when I finally convinced him that some things are better left to the professionals (or at least some guy who has helpers beyond me and 3.5 dogs). Let’s hope this garage drama—and those angry tears—are done and all that I’ll have to report in November is that we have a fabulous new garage and I have packed that closet full! Comment from Cockamamy 10/17: We’ve had several people comment about how HUGE our garage is. Admittedly, it is the same size as the house (which makes it look gigantic in the photos), but don’t forget about how TINY our house is! Both buildings are each 28×30. Great work Ben & Lacey! Hope you have an “Open house” someday. You are both so talented!